I had these pics First Mr Yezy but everyone will look at his blog before mine, but whatever!!! 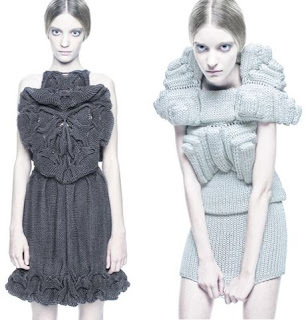 So these dresses are created by Designer Sandra Backlund who used great imagination to pull out these knitting situations. To be able to get those Shapes must have taken so much hard work and patients is definitely key. I love these pieces and will suggest that if anyone daring enough to wear them should make sure you have a good set of underwear on!! !